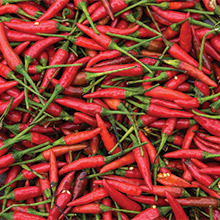 Chile De Arbol originates in Mexico like many hot peppers. The name De Arbol translates to Small Tree or Tree like referring to the way the plant grows rather tall with a thick stem or trunk and branch out like trees. The 2-3 inch fruit of this chile are narrow and curved and have a smoky flavor which is great for chili. They start out green and mature to a dark red. On the Scoville scale, they rate rather hot coming in around 30,o0o SHU. Like many other HOT peppers, it is wise to wear gloves and refrain from touching your eyes or mouth while preparing. These are often the peppers that you see dried and hung on strings called ristras or incorporated into wreaths. Being sensitive to the cold, planting should be delayed until the danger of frost is past in the spring. Ideal temperatures are 70 to 80 degrees F during the day, and 60 to 70 degrees F at night. Usually, the plants set satisfactory crops when temperatures are between 65 and 80 degrees F and the soil is well-supplied with moisture. Avoid a soggy, water-logged soil condition when growing peppers. Height: Grows 36″ to 48″ tall. Outstanding Features: Chosen by many chili cook-off participants as the best pepper for flavoring chili.